THE HAGUE, Netherlands – An international prosecutor said Friday he will seek arrest warrants next week for three top Libyan leaders on charges of murder and persecution during their attempts to crush the uprising against Moammar Gadhafi’s regime. Luis Moreno-Ocampo, chief prosecutor of the International Criminal Court, did not release the names of the suspects, but Gadhafi himself is expected to be among them. Moreno-Ocampo revealed broad details of his investigation last week to the U.N. Security Council, but the announcement was the first time the court specified the charges — murder and persecution, considered crimes against humanity under the Geneva Conventions. Prosecutors say their investigation has identified “three individuals who appear to bear the greatest responsibility for crimes against humanity” committed in Libya since Feb. 15, when Gadhafi’s forces began a brutal crackdown on anti-government rebels. A panel of judges will review the prosecutor’s evidence before deciding whether to issue the warrants. It is not clear how long the judges will take before reaching a decision. The announcement came as NATO launched more airstrikes in Tripoli and Gadhafi’s protesters and soldiers engaged in gun battles in several of the capital’s neighborhoods. 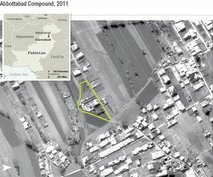 On Thursday, Gadhafi’s fortified compound in the capital was among the targets hit by NATO aircraft and missiles. The U.N. Security Council voted unanimously on Feb. 26 to refer the Libyan crisis to the international court in The Hague, and Moreno-Ocampo launched a formal investigation just days later. Italian Foreign Minister Franco Frattini said Thursday said he expected the ICC to ask for Gadhafi’s arrest, which would complicate any suggestion of the Libyan leader accepting exile as a way to end the conflict in his country. Investigators have collected “extensive and solid evidence” during 30 missions to 11 countries and have interviewed more than 50 witnesses, including “key insiders,” as well as reviewing videos, photographs and other evidence, the prosecutors’ statement said. They hailed the court for acting in what they called “real time” to prosecute crimes, unlike the international community’s response in other deadly conflicts in the past. “There was no ICC when the Rwanda genocide happened and the Darfur situation was referred to the ICC two years after the beginning of the crimes against the civilian population,” the statement said. Because the case was sent to the court by the Security Council, Gadhafi will become an internationally wanted suspect if he is indicted and all United Nations member states will be under an obligation to arrest him. However, that does not guarantee he will be detained if he ventures outside Libya. The court’s judges have reported three countries to the Security Council for allowing Sudanese President Omar al-Bashir to visit without arresting him. Al-Bashir has been indicted for crimes including genocide in Darfur in another case ordered by the Security Council. The court has no police force of its own to arrest suspects. Prosecutors said they expect more details about such crimes in a report due to be published June 7 by a U.N. Commission of Inquiry probing allegations of human rights violations during the Libyan uprising. The United Nations is calling for an immediate cease-fire in Libya as recent heavy fighting left more than a dozen dead in the western part of the country. U.N. Secretary-General Ban Ki-moon and his top humanitarian envoy Valerie Amos expressed deep concern over the magnitude of the conflict as well as its toll on civilians. 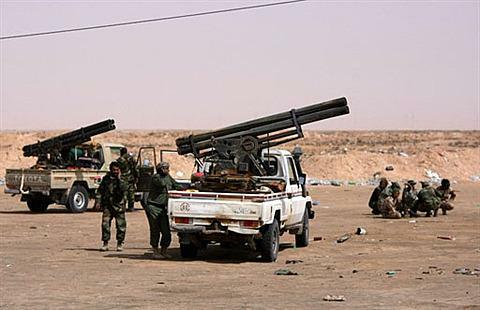 Shelling and sniper fire by forces loyal to Libyan leader Moammar Gadhafi killed 17 people in the western city of Misrata Sunday, while rocket and artillery attacks on the eastern town of Ajdabiya sent rebel fighters and civilians fleeing. In Misrata, at least 47 people also were wounded in the fighting, during which Gadhafi’s forces fired on a makeshift trauma center. The city has been under government siege for the last seven weeks, leading to a growing humanitarian crisis. U.N. and Libyan officials say they reached an an agreement Sunday to allow aid workers safe passage to Misrata. Ban says the world body, which is already providing aid in the rebel stronghold of Benghazi, will also set up a humanitarian presence in the capital, Tripoli. Sunday marked one month since the U.N. Security Council passed a resolution authorizing an international air campaign to protect civilians in Libya. In London, British Prime Minister David Cameron said Britain will not send occupying ground forces into the North African country. The NATO alliance has carried out airstrikes against loyalist forces in Libya to enforce the U.N.-authorized “no fly” zone protecting civilians from attack by Gadhafi’s troops.